Opened a project I hadn’t looked at for a while by clicking a link to the project itself from Omnifocus. To see the newer of the two notes in the project first. The older of the two notes appeared first instead of second. I changed it to earliest first, and the older moved to the bottom. I changed it back and the older one went to the top. Created a note with today’s date. That I’d have three notes sorted properly somehow? If I click on the project name at the top, they are in the same order and at the bottom, it says, “Sort with earliest date first”, indicating the earliest note should be last. I tried to check if the November 28 note was pinned to the top, but it doesn’t seem to be, plus the new one dated today wouldn’t be first, if it were. I did pin it to the top and unpin it which had the expected result — the pinned note went to the top and then back to its previous (incorrect) position. I tried clicking on another project and coming back to this one but that didn’t make any difference. I assume this is a fluke of some kind and nearly impossible to reproduce. I suspect there is something about the November 28 note that’s messing it up. 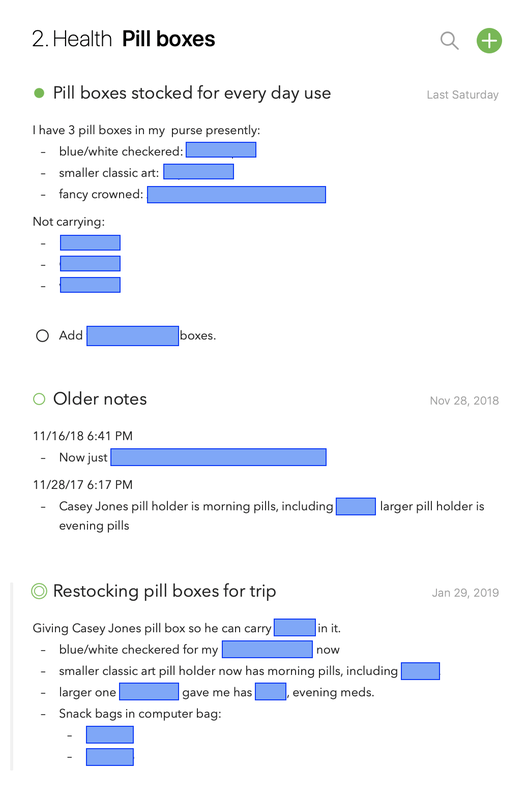 It contains text pasted in from an Omnifocus note, but I have other notes I created that way that are staying at the bottom as the earliest in their projects. If you want me to private message it to you, let me know. I exported it as an agenda file since I’m going to be editing it since I need Today’s note to have the current information. Thanks for the report, two questions. Could you send us a series of screenshots of what you describe, that would make it much easier to fully grasp the issue? Second, did you perhaps create these notes using a x-callback-url? I did not use x-callback-url to create the notes (I’ve never used that feature). For the earliest note, I probably created it in January when I created to Jan 29 note. I probably went back thru the calendar and set the date, but I might have put the date in the title and done it that way instead. I’m not sure why I set it to Nov 28, 2018 now; I think I meant to make it Nov 16. I did change the title of the note created April 13 and put current information in it, but other than that, the notes are as I reported above. In the screen shot below, none of the notes are pinned; it’s sorted like probably all my projects are, so the newest should be at the top and earliest at the bottom. The stuff under the blue boxes is just normal text, usually a word or two with names of meds. Nothing is bold or italic; no links. I’m not sure what series of screenshots would help, and not inclined to guess since it’s a little tedious to do with so much to cover up. Alternatively, I could try taking most of the text out (after recreating the notes in another project for my use) and then make different screenshots. That’s bizarre, thanks that helps a lot. If you change the date of that middle note in the screenshot to say Nov 16, 2018, does it now sort to the right position? Yes, changing the date to Nov 16 moved it right down. I changed it back to Nov 28 and it stayed where it should. So, it sounds like it’s something about the date as it was. I private message you the Agenda file that I saved earlier. Ok great, sounds like a glitch, possibly from an old version already. Please let us know if you see any more odd sorting occur, especially with new notes.